Click here to access Protective Enclosures Company's helpful installation instructions or schedule installation support. 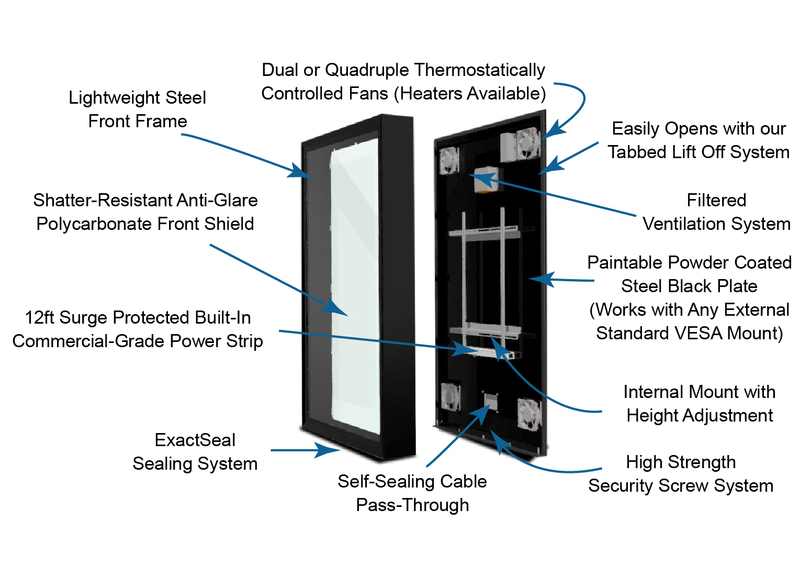 The TV Shield PRO PortraitTM is a weatherproof, secure and robust protective outdoor display enclosure that is made in the USA and built completely from triple coated steel for ultimate strength and durability. 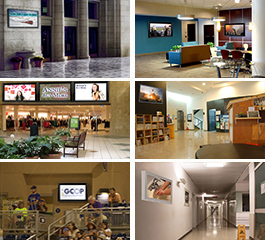 Designed for use with any standard indoor TV or digital display, it is ideal for commercial and professional markets where a monitor is needed in a vertical orientation. With its sleek and aesthetically pleasing picture frame design, it will seamlessly integrate into any high-end environment. Developed for outdoor areas, The TV Shield PRO Portrait’s proprietary "Quick Install" system is faster to install and maintain than other metal TV enclosures and the front frame opens effortlessly with our tabbed lift-off system. The internal mounting system can be used with any VESA pattern from 75x75 to 600x600 with depth and height adjustment (with supplied hardware) which allows for perfect placement of the screen as well as easily added input and back of display access. In addition, The TV Shield PRO Portrait can be used with any external standard VESA mount. The entire unit is locked down with our high strength security screw system that requires a specific tool to remove the front panel and comes with a thermostatically controlled and filtered air circulation system boasting multiple 120mm high powered fans and 60ppi filters. The TV Shield PRO Portrait is a professional-grade weatherproof digital display and outdoor LED TV enclosure which comes standard with a shatter proof anti-glare polycarbonate front panel for ultimate safety of your equipment and patrons. Unlike safety glass, which can shatter, polycarbonate does not. The TV Shield PRO Portrait also comes standard with a custom-built aluminum commercial-grade power strip with a 12 ft. cord and 15-amp breaker. Size options range from 40 inches to 65 inches. Protective Enclosures Company is the leading US manufacturer of protective TV enclosures and PEC's enclosures are currently used in over 23,000 locations in 38+ countries! • Sleek and aesthetically pleasing picture frame design for integration into any high-end environment. • Compatible with almost every 52” to 55” TV or digital display. You can pick and choose what technology and features you want in a TV or display. • 5-year warranty for guaranteed peace of mind. • Protection equal to IP-55 standards. • Paintable powder coated steel housing. Custom colors available. • 60ppi filtered ventilation system with dual or quad thermostatically controlled 120mm fans. • Hardware and components are stainless steel or powder coated (using our advanced chemical pre-wash system) for ultimate durability against harsh threats like saltwater air. • Includes high strength shatter-resistant anti-glare polycarbonate front shield. • Front panel easily removed with our tabbed lift off system. • High strength security screw system that locks the entire unit and requires the provided tool to access the interior of enclosure. • ExactSeal triple sealing system for superior dirt & water intrusion prevention. • All ventilation and cable pass-through systems are protected against bug and water intrusion with 60ppi filters and our ExactSeal system. • Internal mount with depth & height adjustment for perfect placement of screen and rear input accessibility. • Ample interior space behind the TV for installation and protection of cable boxes, media players, amplifiers or any other component required. • The TV Shield PRO Portrait can be used with any external standard VESA mount (floor, ceiling, wall, pole) and can be flush mounted against (not in) the wall with professional installation and separate hardware. • Built-in commercial-grade power strip (with 12 ft. cord and 15 amp breaker) for additional protection in harsh environments.